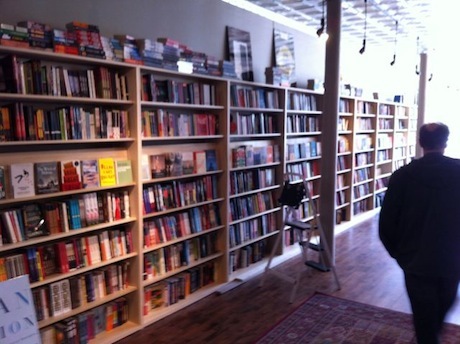 Oh MN Readers, yesterday I had the extreme luckiness to go take a sneap peek at the new Common Good Books (which I always refer to as CGB in my head because it reminds me of CBGBs) at the corner of Snelling and Grand (38 S. Snelling Ave for you stickelrs). The new place is glorious. 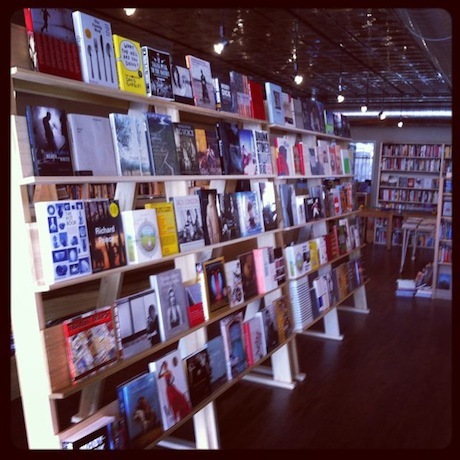 When you first pop in the door you’re greeted with that awesome wall of books pictured above. And so much sunlight you’re a little amazed. At least I was. I’m used to bookstores being kind of dark and artificially lit. 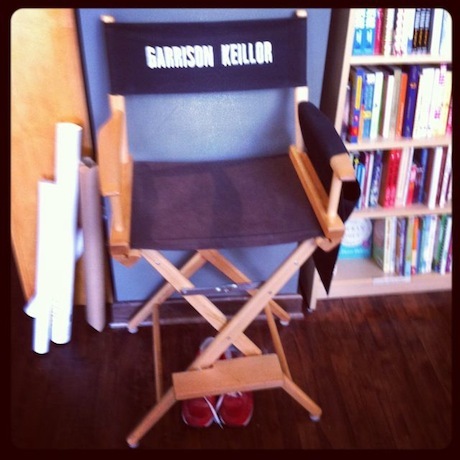 Also, Garrison Keillor’s chair and red shoes (please forgive the blurriness, I’m a writer not a photographer). David Enyeart of Magers & Quinn fame, and now the assistant manager at CGB showed me around and I don’t think I could have kicked the smile off his face. He talked about how excited he is to bring authors into the new space, which is nice and open. 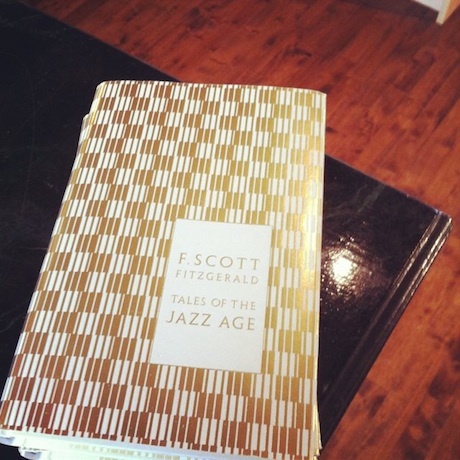 You can check out their first event at the new digs on April 11 when Bart Schneider reads. 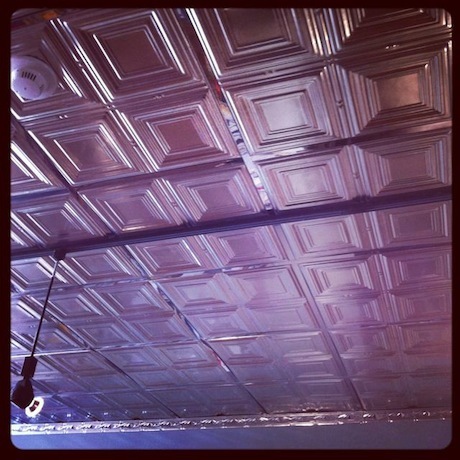 David also talked about how awesome the proximity to Macalaster (their landlord) is. If he lures some big names (fingers crossed) to St. Paul he’ll have easier access to Macalaster’s larger spaces. While I was poking around the Mill City Bibliophile popped in and was instantly enamored with the newsstand near the front of the store featuring a ton of lit magazines. I didn’t take a picture of it. You’ll just have to take my word for it. 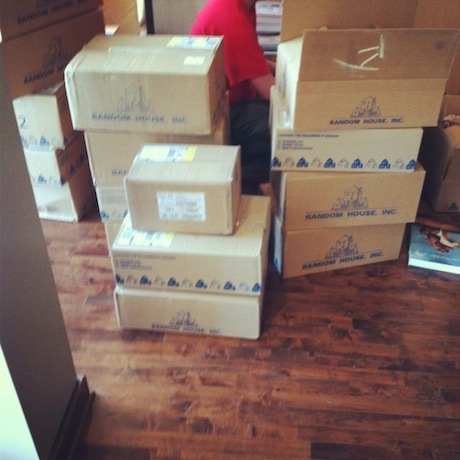 The crew was still unpacking and arranging books yesterday (and probably will be all weekend), prepping for the soft opening on Monday, April 9, at 9 a.m. There’ll be a big grand opening in May with some events featuring Garrison Keillor. If they’d have had the sofa and club chairs set up, I’d have probably moved in. There’s just something about being surrounded not just by books (I’m surrounded by them most every breathing hour of my life), but people who also love books that I can’t get enough of. Though I’m sure the loafer reading while everyone else was working might have been a little annoying. Seriously people, you need to check out the new Common Good Books as soon as you can. It’s amazing. There But For The what, huh?